We love reading over here. My mom and I both have a saying that "you can never have too many books". But even with all the reading we do around here, can you believe that we didn't have a library card and we've never borrowed a book since Noah's been born. Honestly I don't remember the last time I've borrowed a book from a library... maybe college? We've taken many trips to the bookstore and received many books as gifts, and I personally read all my books on my Kindle app. "If You Give a Mouse a Cookie" | "The Little Gray Bunny"
"Elmer and the Monster" | "Let's Dance, Grandma!" "Pete the Cat and His Magic Sunglasses" | "How Do Dinosaurs Say Good Night?" But now that Noah is getting into more actual story books with paper pages instead of thick board books, I thought it was time to get us library cards and start borrowing books regularly. So far we've gone twice (we had gone to the library many times for music and story time, but not to take books out). The first time, we took out the 6 books shown above. Noah was so excited to get his library card... they even gave him a lanyard necklace to keep it on! I think he was super confused when I told him we could take the books home! We also have our fair share of books at home. 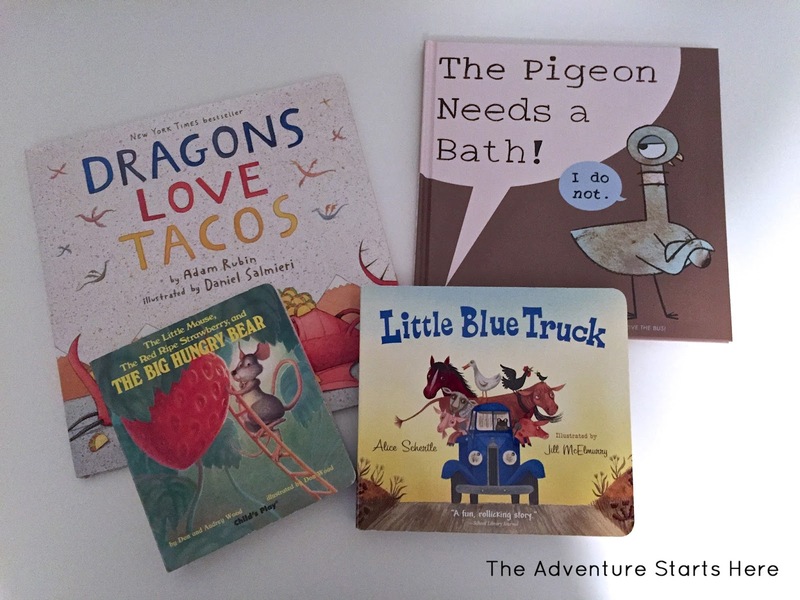 Some of our current favorites are "Dragons Love Tacos", "The Pigeon Needs a Bath", "The Little Blue Truck", and "The Big Hungry Bear". We like reading before nap and bedtime, but I also like to just read randomly throughout the day. 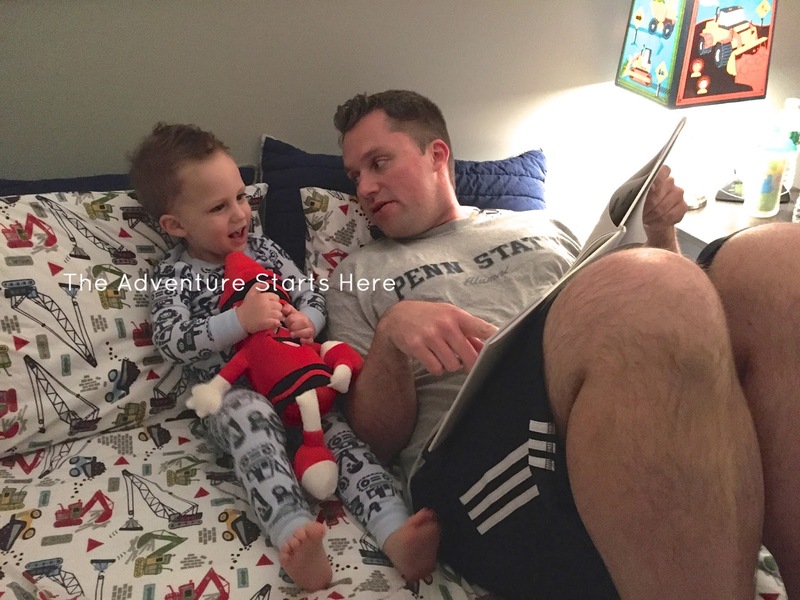 I always love to get recommendations from other parents... so what are your favorite books for 2-3 year olds? I am linking up with Stephanie and Elizabeth for the Summer Reading Challenge! You can check out this post for all the details! One book my grandchildren love and it is such a classic - Goodnight Moon by Margaret Wise Brown. The nightly ritual when I tuck them in at their house or mine is we have to say goodnight to everything in the room, just like in the book. This book never goes out of print! I read it to my girls (over 20 years ago) and now to them. I love this! You know, we've never taken Mason to the library either. We stopped by for a quick second on Saturday before the police station open house but I wanted to let Mason look around and choose some books, so we'll be going back. However, when we were in there, all he really wanted to do was run up and down the aisles... while it was so, so quiet and everyone was studying lol. I better go again before we get banned from there for being too loud! We love books and I didnt take my daughter to the library until she was 3, so shameful ;) Dragons Love Tacos is a favorite around here too! Whenever holidays or birthdays come around and people ask what to get my daughter, I always say "you can never have too many books!" So, so true! And I don't think I've been to the library since I was in college. I have a thing for buying and keeping books though. 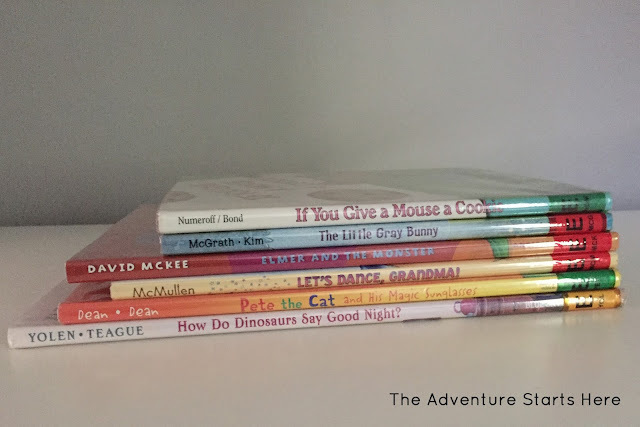 The only books on your lists we've read are If You Give a Mouse a Cookie and Little Blue Truck, so I'm excited to check out the others you have listed! Another great book that is probably the absolute favorite in our house is The Monster at the End of This Book. The "if you give a..." books are some of our favorites! One of them is almost always in the rotation! Our library is doing a summer reading program and for every four books they get a prize. Which is ridiculous for the younger kid's books. Every time we go now Reed picks four random books and stares at the box for his prize while hurrying me along on the reading portion. Last one was a tambourine, as if I need more loud instruments in my life. Am I a humbug if I'm over summer reading program already?? First library card! I love it. I'm glad you guys got to the library. It is a great age to start going. Aria reads so much we'd never be able to keep her in new books without going bankrupt. Praise the library! Little Blue Truck and the Pigeon books are hits here. Try the Bear books by Karma Wilson!